Standard and Poor’s, one of the big bond rating agencies, has announced today that they are giving a “downgrade warning” on U.S. government bonds. Not a downgrade in credit rating, but just a “warning” that things could be downgraded. Ho hum. Such theatre. As if we should believe S&P. First, a sovereign currency-issuing government with a currency that is non-convertible (no gold standard and no fixed exchange rates) and that borrows in it’s own currency cannot go bankrupt. It cannot default unless it chooses to do so. Period. Money can always be created to pay the bonds as they come due. In fact, money and bonds are pretty much the same thing. Issued by the same people. It’s just that bonds pay an interest rate. The currency notes in your pocket don’t. Besides, S&P has done this before. 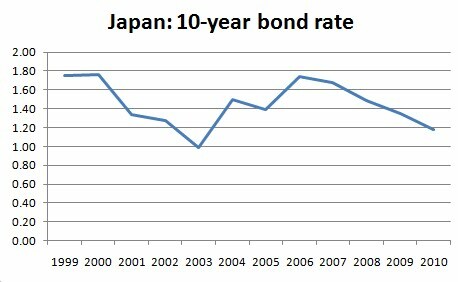 Let’s see, in 2002 they not only warned, they actually downgraded Japanese debt. Let’s see how that worked out. Surely a down-rated bond issue must have raised Japan’s borrowing costs as lenders (bond buyers) demanded higher rates to compensate for the risk of default, right. Umm, no. Japan continues to borrow at extremely low cost. Still payin gless than 1.8%. No problem. When you hear this stuff, remember S&P are one of the outfits that told everybody that subprime mortgage debt could be AAA rated, the best. They were wrong on Japan. They were wrong on subprime. They’re wrong now. Remember it’s all political theater. It provides talking points for “serious people” to worry about a deficit that’s not a problem so they can cut social programs.